I am probably not the only one who is sad that there are no new CSA vegetables this week. 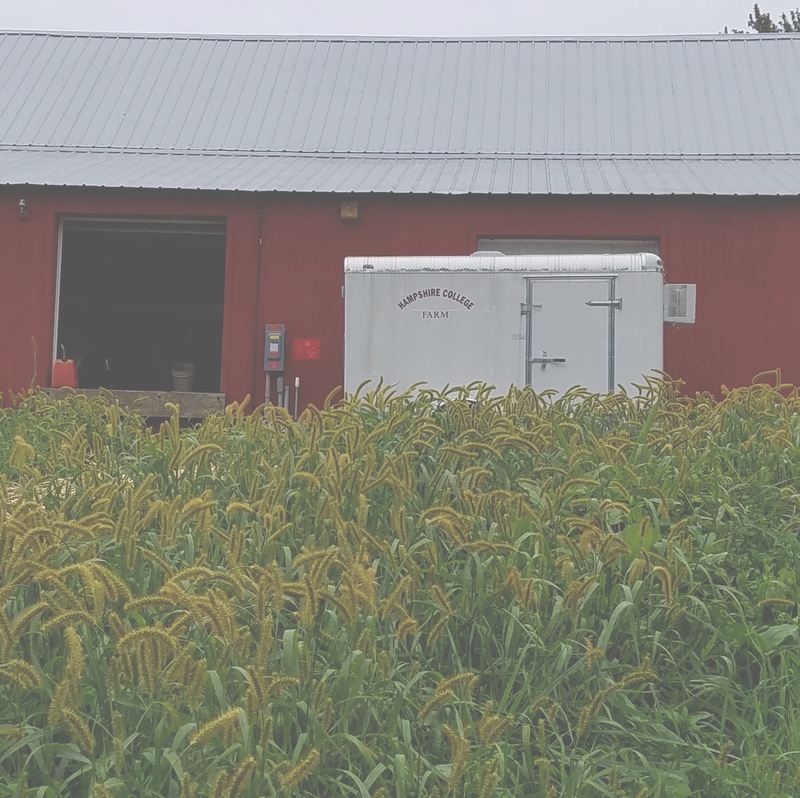 I will miss my weekly trips to the CSA barn, not to mention all the lovely vegetables in my kitchen. I suspect that I’m also not the only one, though, whose CSA share will last at least a few weeks into the future. Scattered around my kitchen are bags of miscellaneous root vegetables; a bowl of sweet potatoes sits on the table beside several butternut squash. My refrigerator still holds slightly too many 2 lb bags of carrots, but I’ve slowly been making my way through the surplus of lovely leeks by making multiple batches of potato-leek soup. First, I made it plain, then enhanced with a bit of celeriac for flavor and most recently, with celeriac and carrot both. It’s not exactly just potato-leek soup anymore, but it’s a lovely light orange from the carrot and makes for a satisfying dinner, especially on a cold night. This would work as a side dish and would also be a fabulous thing to serve the vegetarians at your table. They will not miss the turkey (that they probably weren’t missing in any case) if this is one of their options. 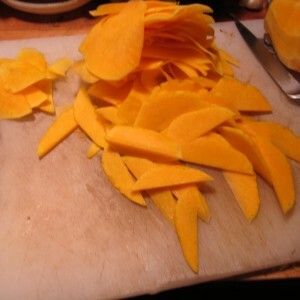 And then I used a knife and tried to slice as thinly as possible, with mixed results. 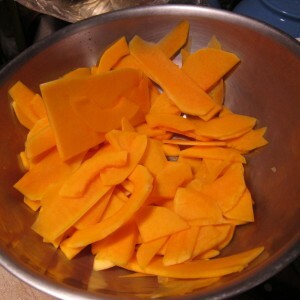 If your squash is on the thicker side, know that you might need to cook it a bit longer. Meanwhile, you cook your spinach. I streamlined the original recipe a bit. 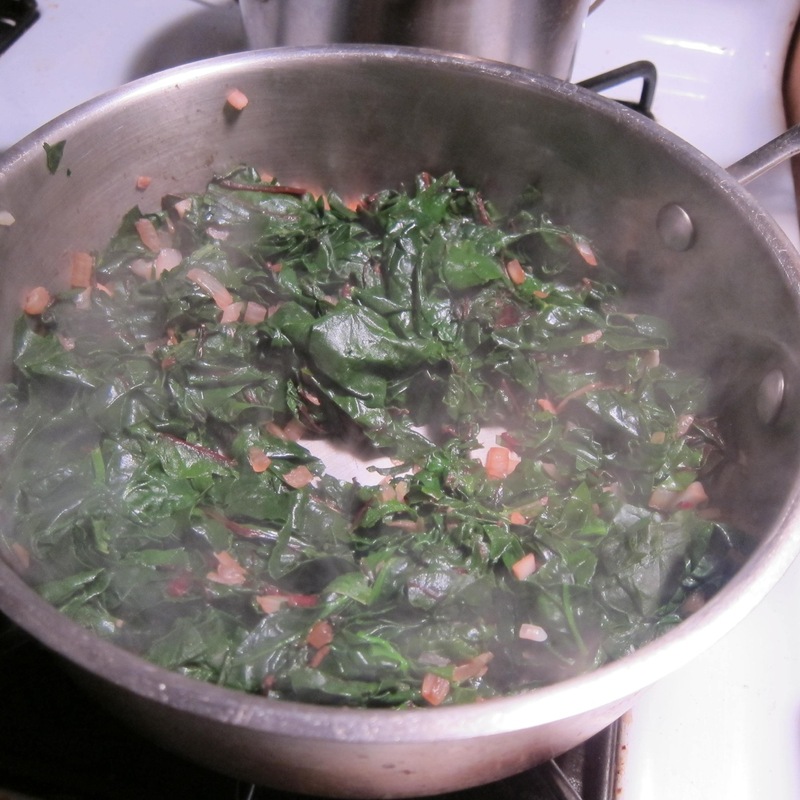 It wants you to wilt your spinach first, then chop it and add it to your onions and garlic. Instead, I washed and chopped it first and then added it to the onions and garlic to cook down. (I also used a mix of spinach and chard, which is what I had on hand.) Once it was all cooked, I added the cream directly into the pan, saving another bowl from having to be washed. 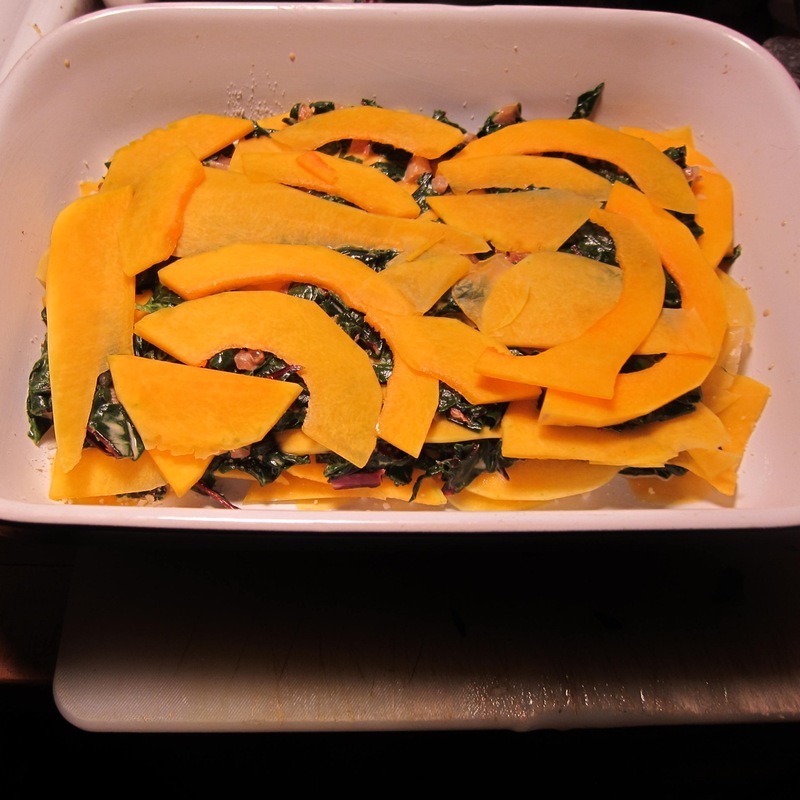 And then you start layering your squash and spinach into a buttered pan. The limiting factor is the spinach mixture, but I had enough to do the 5 layers of squash and 4 layers of spinach that the recipe recommended. Then, you sprinkle the top with Parmesan (I had used some in between each layer as well), and dot it with butter. (I reduced the amount of butter but used a bit.) And then you cover it up parchment or waxed paper and pop it into the oven. I’ve realized, though, that there is an easy solution to this problem of excess squash. I plan to make another batch, and just in time, as the first one is already gone. Put oven rack in upper third of oven and preheat oven to 400°F. 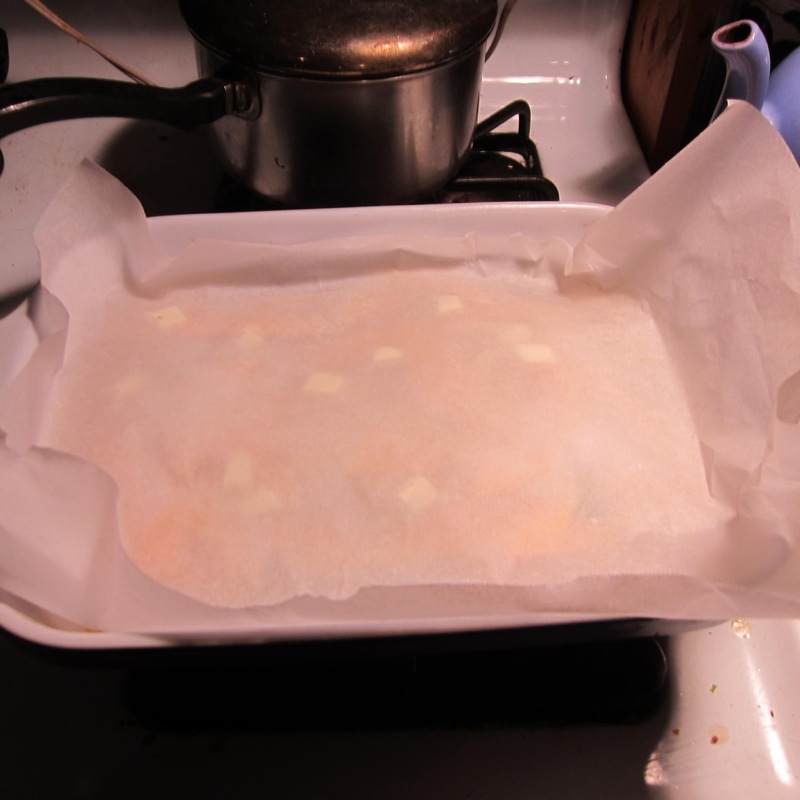 Butter a 3-quart shallow baking dish (13 by 9 inches; not glass). 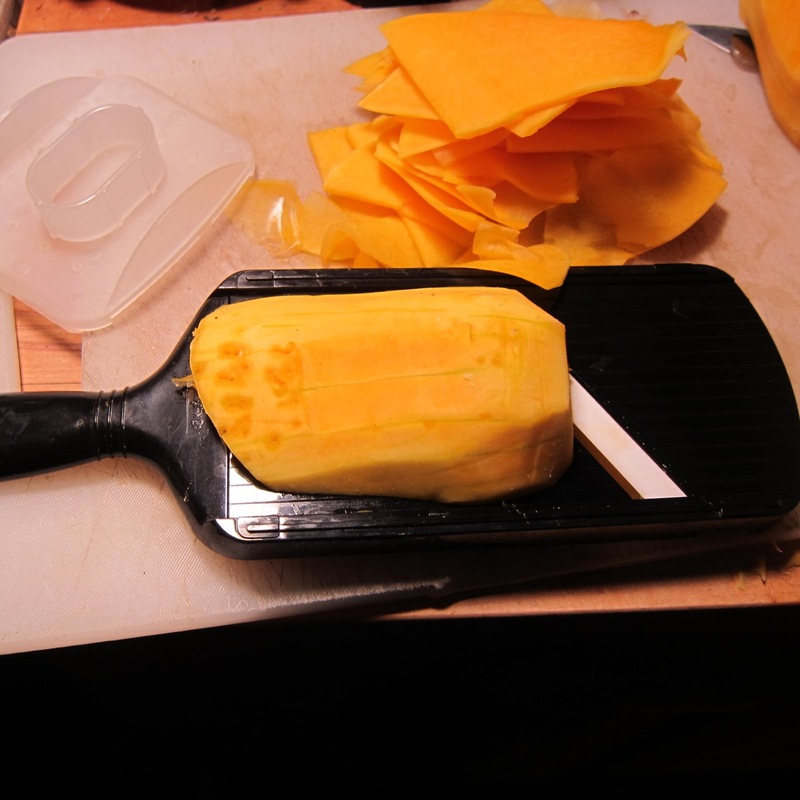 Cut squash to separate bulb section from solid neck section, then cut pieces lengthwise into 1/8-inch-thick slices with slicer (or food processor, mandoline or knife). Melt 3 tablespoons butter in an 8-inch heavy skillet over moderately low heat, then cook onion and garlic, stirring, until softened, 3 to 5 minutes. Meanwhile, take the stems off of the spinach or chard, wash well and chop roughly. Add salt, pepper, nutmeg, and cream and stir to combine. 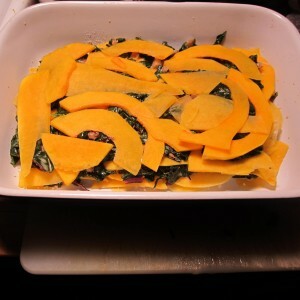 Layer squash and spinach mixture in baking dish, using about one fifth of squash and one fourth of spinach for each layer, beginning and ending with squash. You can add Parmesan or Romano cheese in each layer as well if you want more cheese. 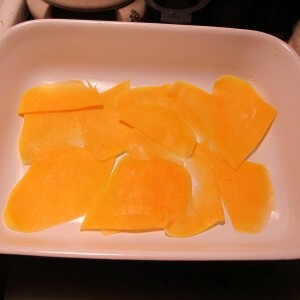 Sprinkle top layer of squash evenly with cheese and dot with remaining 2 tablespoons butter, then cover directly with a sheet of parchment or wax paper. 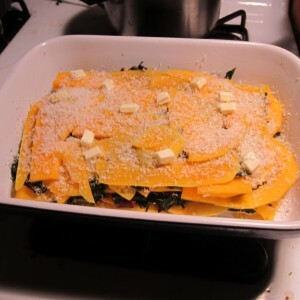 Bake until squash is tender and filling is bubbling, 25 to 30 minutes. Remove paper and bake gratin until browned in spots, 10 to 15 minutes, or broil 3 inches from heat, 2 to 3 minutes. Yum! I actually made something very similar for Thanksgiving this year. I didn’t think to use spinach, but I made a butternut gratin layered with sauteed shallots and garlic. 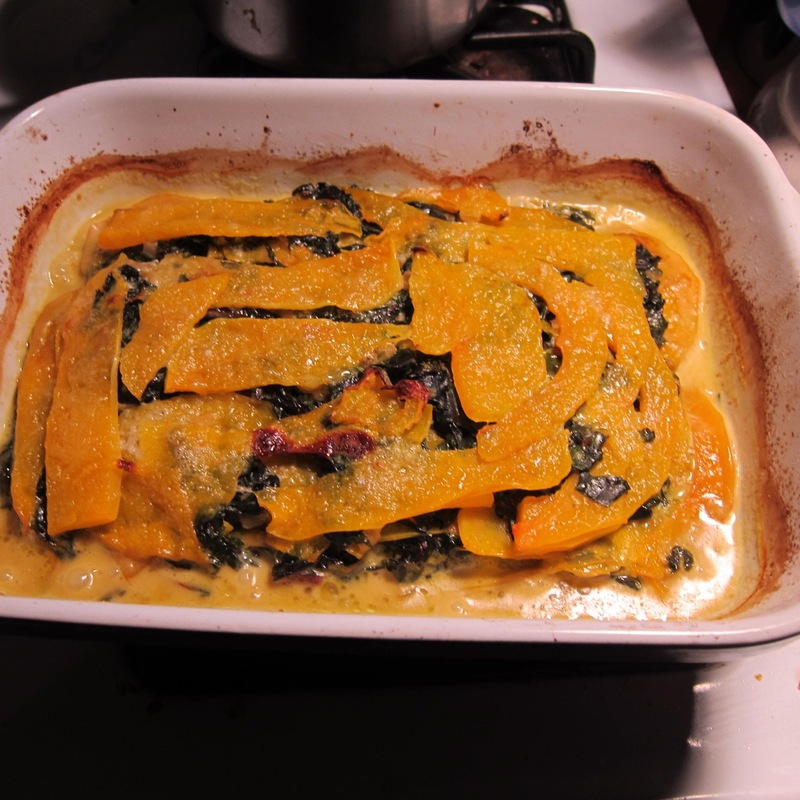 I dusted the butternut slices with a little bit of coconut flour for some added texture, and I made a bechamel with cream, butter, and cooked sweet potato (instead of flour), and poured that over everything. I used grated gruyere cheese instead of parmesan. I’ll definitely make it again, but I think I’ll try adding spinach next time.